Revellers celebrate Guy Fawkes Day. In 1605 Fawkes unsuccessfully attempted to commit the infamous act of terror of blowing up King James I and the Houses of Parliament. The English, among other talents, are adept at nurturing their grudges. How else does one explain the enduring enmity toward Guy Fawkes, a conspirator in a plot to blow up Parliament in 1605? Some four centuries after Fawkes was caught, tortured and executed for his role in a scheme that never came to fruition, Britons still celebrate his demise each Nov. 5 by burning his likeness in effigy and setting fireworks ablaze. One of the ironies of Fawkes' legacy is that he was a late addition to the infamous "Gunpowder Plot." Born a Protestant in 1570, Fawkes enlisted in the Spanish army in the Netherlands around 1593, shortly after converting to Catholicism. Co-conspirators Robert Catesby, Thomas Winter, Thomas Percy and John Wright enlisted Fawkes as a ringer, reasoning that his military skills  he had participated in the 1595 capture of Calais, France  and his anonymity as a foreign soldier made him an ideal candidate to help execute their plan. Fawkes' henchmen were zealous Catholics who believed that by beheading the government, they might usher in a new era of Catholicism in Protestant England. Led by Catesby, they hatched a plan to explode gunpowder under Parliament during a state opening, when King James I, his queen, and other family members and government leaders were inside. The plot was set for Nov. 5, 1605, and in the preceding days, the conspirators rented a cellar underneath the building, where Fawkes stashed at least 20 barrels of gunpowder. Things didn't go according to plan. The plotters sought wider support, and, as the story goes, one of the individuals to whom they reached out alerted his brother-in-law, a lord, not to attend Parliament on Nov. 5. The building was searched, and Fawkes was apprehended along with his stockpile of gunpowder. Tortured on the rack, he revealed the names of his co-conspirators. Some of them were killed while resisting arrest; others, including Fawkes, pled not guilty and went to trial, where they were convicted of high treason. In January, 1606, the remaining conspirators were hanged, drawn and quartered. Parliament immediately established Nov. 5 as a day of celebration. Today, Guy Fawkes Day  also known as Bonfire Night  is marked across the United Kingdom by celebrations. To foot the bill for the traditional fireworks, children roam the streets in the days leading up to the event, brandishing their effigies  known as "Guys"  and ask passers-by for a "penny for the guy." (The phrase famously serves as the second epigraph to T.S. Eliot's 1927 meditation on despair, "The Hollow Men.") Families gather for food and festivities that might seem incongruous with the event's bloody origins  although perhaps not as incongruous as lighting fireworks and bonfires to celebrate an abortive attempt at arson. In recent years, Fawkes' legacy has broadened. He provided the inspiration for the tile character in the Wachowski brothers' V for Vendetta, in which a masked crusader embarks on a terrorist campaign against a totalitarian British dystopia. Fawkes also proved an effective fundraising rally cry for onetime U.S. presidential candidate Ron Paul, who garnered more than $4 million on the holiday in 2007 from a website commemorating Fawkes. 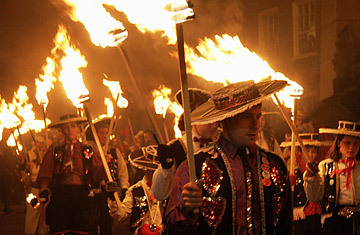 This year, revelers will gather across Britain  most notably in Lewes, a town once known as a hotbed of anti-Catholicism sentiment that throws one of the British Isles' biggest conflagrations  and in nations ranging from South Africa and Canada to New Zealand and Australia. Guards will also perform the annual search more pageantry than precautionof the Houses of Parliament to ensure no would-be Fawkes is lurking. Though the animosity and rituals may merely be symbolic at this point, the celebrations still burn brightly.